This Bride's Elaborate Wedding Jewellery Was Even Better Than Sonam Kapoor's! Sonam Kapoor had us at hello in her gorgeous bridal avatar. Her traditional red lehenga and heavy vintage jewellery made her look like the perfect regal dulhan. A bride's ensemble is what makes her feel special on her big day and so it has to be all things perfect! And though we see a lot of brides on an everyday basis (all thanks to our job! ), this one bride stood out from the rest for more reasons than one. 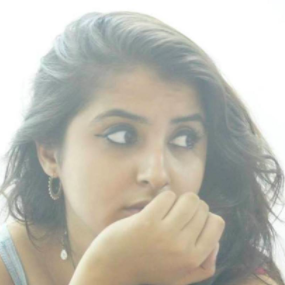 Meet Sanaa Choksi. She's the glam, millennial bride with a touch of regal elegance. We're in love with her earthy red lehenga, but more than that it's her jewellery that has us completely bewitched. Sanaa chose to wear a Raw Mango design for her big day and it is just the right mix of conventional and modern. The lehenga skirt and blouse were intricately woven with gold thread work detailing and the dupatta was sheer with big floral motifs and a thin gold border. Big thumbs up! 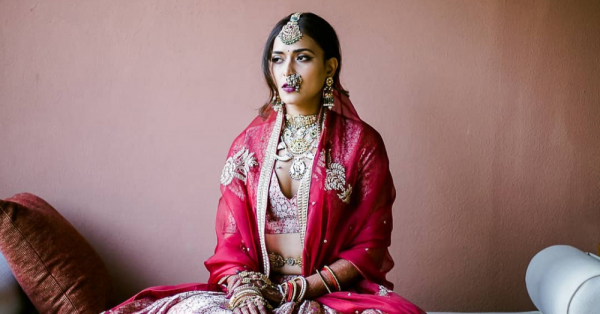 For her bridal accessories, she took the sentimental route and wore her mother's jewellery except for the maangtika, nath and a Cartier love bracelet. Just like belts enhance one's waistline in western outfits, kamarbandhs do so for Indian outfits. Bride Sanaa adorned her ensemble with a kamarbandh and we're loving the vintage touch it lends her bridal look. Makeup wise, she went for a subtle eye look and a bronzy sun-kissed base. She opted for a bold raspberry colour on her lips. It wasn't the exact shade of her outfit but still complimented it gorgeously. One thing we've realised after looking at this bride is that it's all in the details. Look at the vintage maangtika and nath with dangling pearls. And that strand of hair is framing her face perfectly. Not everything has to be in place, that's the beauty of candid shots! Look at the groom's matchy-matchy saafa! Well done dulhe raja! In the end, we're going to be cliché and say that it's Sanaa's infectious smile that made her the prettiest bride on her shaadi. So accessories, outfit and makeup aside, wear that smile and ufff... you're all set to slay!